Structure My Deal tools are complete — you're ready to visit Reliable Chevrolet! Interested in a 2016 Chevy Equinox in Springfield? You'll be pleased to know that the 2016 version of the compact SUV features positive enhancements and changes that make this year's Equinox the best yet. 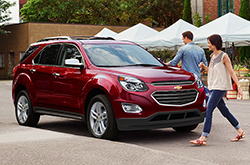 Now available with a new trim lineup, a restyled grille, enhanced interior and exterior designs and extra safety features, the 2016 Equinox is the perfect vehicle for all of life's adventures. Check out the rest of our 2016 Chevrolet Equinox review for more information regarding all of the terrific features that make the Equinox a top choice for buyers. Although most of the Equinox remains unchanged for the new model year, the crossover does see a few notable changes, including higher-quality interior fabric, a revised center instrument panel, a seven-inch Color Touch radio, a new interior color and redesigned headlamps. These refreshing interior touch-ups only add to the Equinox's existing technology, such as its 4G LTE Wi-Fi connectivity, premium sound system and Chevy MyLink infotainment system. 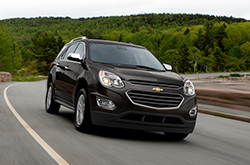 As a vehicle built on top-notch safety, the newest Equinox does not disappoint. In fact, the Equinox is a leading choice when it comes to safety according to many 2016 Chevy Equinox reviews. With available OnStar programs, side blind zone alerts, rear-cross traffic alerts, forward collision alerts and lane departure warnings, the Equinox's optional safety packages add extra peace of mind to the family car. Standard safety features include a new rear-vision camera system, premium airbags and LATCH anchors for safety seats. Equipped with a standard Ecotec 2.4L engine and an available 301 hp 3.6L V-6, the Equinox is equipped with top-of-the-line power. Plus, the Equinox provides 63.7 cubic feet of space when the rear seats are folded, while the V-6 model can trailer up to 3,500 pounds, making any job - big or small - simple and easy. The 2016 Chevrolet Equinox in Springfield is a top choice when it comes to a capable crossover that can meet all of your needs without undesirable compromises. To learn even more, check out additional information below or test drive an Equinox today. Is the Chevrolet Right for You? Compare the 2016 Chevrolet Equinox side-by-side with vehicles like the 2016 Honda CR-V, Toyota RAV4, Kia Sportage, Ford Escape, GMC Terrain and the Nissan Murano, and we're sure you'll realize that the Equinox outshines the competition in a variety areas. MO shoppers will appreciate the Equinox's useful features and competitive MSRP. It's a fantastic value, which you'll definitely see when comparing its price to the vehicles listed above. View our Quick List under this text to find out more! 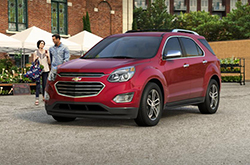 Thank you for reading Reliable Chevrolet's 2016 Equinox review! Experienced automotive writers performed countless hours of research to write the reviews on our site. Make educated decisions when it comes to your next auto purchase - don't take guesses! Each section is packed with data and vehicle features in a format that's easy to understand. Learn more about Reliable Chevrolet's wonderful lineup! Review and compare Chevrolets other vehicles in our digital research directory now!